Bishop will get a community shelter, roads, streets and bridges, and town hall renovations. Bogart will get a "streetscape facility" composed of roads, streets and bridges, and sewer facilities. North High Shoals will get water facilities, roads, streets and bridges, a town hall, and a community building. Watkinsville will get public safety facilities and equipment, recreation and park facilities, roads, streets and bridges, and water and sewer facilities. Oconee County will pay down its debt on its recreational facilities, on the county jail and on the emergency operations center. It also will add water and sewer facilities, roads, streets and bridges. It will get recreational, historical and scenic facilities, fire stations and equipment, and communication facilities. And it will get farmland protection. Voters on March 17 must approve a 1 percent Special Purpose Local Option Sales Tax "for a period of time not to exceed six consecutive years" to pay for the things on the wish list. The tax is estimated to raise $40.4 million. At least that is what will be stated in the ballot language that those who cast their votes will see before selecting either the Yes or No option. The ballot language does not spell this out, but the state will get $400,000 just for collecting the tax. Of the remaining $40 million, the city and towns will get $5.7 million and the county will get $34.3 million. The actual resolution behind the ballot language spells out the maximum amounts that the cities and the counties will spend in specific areas, such as for county roads ($8 million) and farmland protection ($0.5 million). That presumes the county will collect the $40.4 million, or an average of $6.7 million over the next six years. The county currently has a SPLOST in place, due to expire in November of 2009. The average collected for fiscal years 2006, 2007 and 2008 was $5.4 million, and the current fiscal year, 2009, is likely to be below that average. It is doubtful very many people will be paying close attention to these details. In November of 2003, when the current SPLOST was on the ballot, 82 percent approved, but only 1,696 went to the polls, or 10.2 percent of the registered voters at the time. In November of 1999, when the previous 1 percent SPLOST was on the ballot, 75 percent approved, but only 2,152 votes were cast, or 14.4 percent of the registered voters. Across the state, research has shown that SPLOST votes get more support when turnout is low than when it is high. So far, no one has done much of anything to encourage voting on March 17. In November, the county had 21,579 registered voters, and 79.7 percent of them voted in that election. 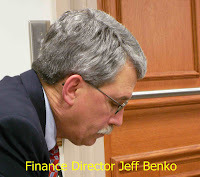 County Finance Director Jeff Benko gave members of the Board of Commissioners records on SPLOST spending at its agenda-setting meeting on Jan. 26. I obtained copies through an open records request. Benko's report shows that the county has approved projects that will largely use up money in the 2003 SPLOST dedicated to recreation and culture, the emergency operation center and the jail. The county as of the end of December of 2008 had about $1 million left to allocate for water and sewage projects, about $0.9 million left to allocate for roads and about $0.4 million left to allocate for the fire department. And the county still has not allocated $4.2 million of the original $4.6 million set aside for county facilities. Talk about what to do with the courthouse has been behind the scenes so far, but funds from SPLOST are supposed to be allocated before it expires. The fiscal year 2009 SPLOST budget, which Benko also released to the BOC on Jan. 26, shows only $185,474 allocated for county facilities, including $75,000 for a new roof for the library. It is clear the county is going to be doing a lot of spending for county facilities from the current SPLOST once voters make their decision on the next one on March 17. In addition to the 1 percent SPLOST sales tax, the county has a 1 percent educational sales tax, which was approved in 2006 and runs for five years, and a 1 percent Local Option Sales Tax, which does not expire. The state collects a 4 percent sales tax, bringing the total to 7 cents on the dollar for most purchases.